Zen is in many ways incredibly simple, usage of the word across various contexts brings images of simplicity and minimalism. At the top level it is the pursuit of Enlightenment through experience, though the way in which this is achieved varies between various school and sects of Buddhism, as well as from person to person. It is believed to have come from Mahayana Buddhism in 6th Century China. Though the Chinese word for Zen which is 禪 is in turn derived from dhyāna, which is Sanskrit and holds the meanings of "absorbtion" and "meditative state". So the possibility exists that Zen actually dates back further than the perceived Chinese origins. Buddhism did move to China from India, so the potential exists for roots within India. When Buddhism moved to China in around 200 to 500 A.D. It was exposed to Taoism and Confucianist influences, both of which shaped the way it was practiced by the Chinese at that time. Zen also has a strong link with Japan, a country for which it is better known. Within Japan there are numerous schools which teach it, Soto, Rinzai and Obaku being the main ones. They again vary in the way in which it is practiced. 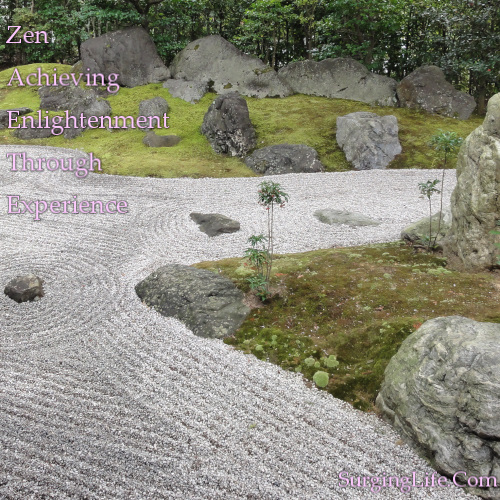 Whilst Zen focuses on achievement of Enlightenment through experience one of the key teachings within its doctrines is that we are already enlightened. Beyond this it is difficult to bring together common teachings due to the variety that exists between the teachings of the various schools, which also vary the way in which they teach and the emphasis they place on different methods of learning. Whilst the various schools have differing thoughts, and differing styles of learning and practice, there is a commonality. That common point, and what is derived from it, is realistically all that matters. The concept that we all came into this world as enlightened beings, and that we are working our way back to that state through life and experience. Once you start focusing on the fact that you were enlightened when you came into this world, that you are working your way back to that state, life becomes very different. The challenges and events in life take on new perspective, new meaning. They can be taken as different lessons, and challenges towards coming back to that zero state of peace and oneness. Zen is a concept. It is a thought. How you choose to pursue it is in part up to you, you could follow the teachings of one of the schools, or go your own way. Practicing the meditation form that comes with this spiritual system is an incredibly good thing to do though, it can help your personal growth in numerous ways, and enrich your life in many others. As a foundation for your personal development it can provide you with an amazing way to enhance, and change your life. To the Zen Meditation section.